Managing Pay-Per-Click campaigns in Google Adwords has been greatly automated and streamlined in recent years through Optmyzr’s innovative PPC Management Software. Today, Optmyzr announced it now offers similar advanced automation to support Bing Ads management for agency and in-house marketers alike. Optmyzr’s award-winning Expert PPC Toolkit gives marketers access to powerful automation tools for campaign optimization, data insight, reporting and other advanced features. 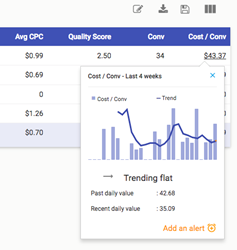 New functionality brings greater power and flexibility associated with Bing Ads to help improve workflow, tap the power of machine learning and artificial intelligence, and help make Bing Ads accounts more effective and profitable. Budget and KPI monitoring: Marketers have access to powerful visualizations and alerts to track and manage against key metrics such as conversions, return on ad spend (ROAS) and cost per conversion. Ability to find new keywords and create single keyword ad groups (SKAGS): Optmyzr’s intuitive Keyword Lasso tool allows One-Click OptimizationTM, which automates analysis of search terms and identifies higher performing search queries. Previously only available to support AdWords accounts, the Keyword Lasso now allows the same ability to identify optimal keywords and create new ad groups that support SKAG ad group structures. New ad creation in A/B testing: Optmyzr now extends ad creation and A/B testing for Bing Ads management. Marketers benefit from automated suggestions for ad content based on what has worked in previous campaigns. Hour-of-week performance optimization: A new Hour of Week Bidder for Bing gives PPC pros recommended hourly bid adjustments, based conversion and cost goals as well as other variables. Ad schedules can be changed in bulk, giving marketers greater ability to turn off ads when they are not needed. Search term N-grams for Bing: New optimizations allow marketers to gain quick insight into long-tail search behaviors, helping to minimize wasted spend and improve results by unearthing words (N-grams) that lead to wasted spend. Landing page analysis: PPC pros benefit from automated tools that help ID stronger calls-to-action to enhance landing page conversion. Geo HeatMap analysis: Optmyzr now brings powerful visualizations of Bing Ads geo data via an interactive heatmap. Marketers can tap this information to analyze traffic and conversions based on location, allowing more strategic budget allocation to the city level. Optmyzr plans to introduce additional Bing-specific functionality for additional instant optimizations and quick insights into account management. Hour-of-Week visualizations in Optmyzr platformHour-of-Week Bidder for Bing gives PPC pros recommended hourly bid adjustments, based conversion and cost goals as well as other variables. Ad schedules can be changed in bulk, giving marketers greater ability to turn off ads when they are not needed.